Without much preamble, here are albums I found particularly notable in 2011. Without a doubt the best record of the year. A strong (but not strident) anti-war record. Beautiful songs and great production. Perhaps the only artist who articulated anything truly compelling and powerful this year. Lots of people don't like this record because it doesn't sound like "Dry" or Harvey's other earlier work. Me, I respect her more for being willing to stretch, reach, and change, and for trying not to repeat herself. It's also a record that holds up to repeated listening. It is not necessarily a record I want to put on every day, but I expect I'll be listening to it for many years. It avoids sounding contemporary in favor of sounding timeless. This is what pop for grown-ups should probably sound like. Many of the hipsters and "cool" listeners I know may point and laugh, but I thought this record was great. Friday has a rich, lovely voice and writes songs that are unabashedly "pop" with big choruses, clear sections, and strong beats, but they're also adult, complex and ambiguous in their meaning and emotion. You can hear the first single "Able" on Gavin Friday's website. 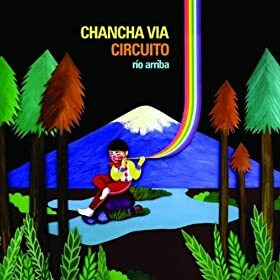 Chancha Via Circuito "Rio Arriba"
Sort of DJ Shadow for Argentinian music. Loops and electronics working with samples and/or acoustic instruments. One of the more unique things I've heard over the last few years. Not necessarily life-changing, but far cooler, more interesting, and more fun than many of the records you'll hear about on everyone else's lists. You can hear the whole album on SoundCloud. When I first heard this record, I assumed it was a debut record from a few talented kids. It has a combination of hooks and weirdness that is usually lost in older artists as they learn how songs are "supposed" to go and records are "supposed" to sound. This record is just polished enough to be palatable, and is plenty catchy to boot. I probably won't be listening to this in a year or two, but I really enjoyed it this year. 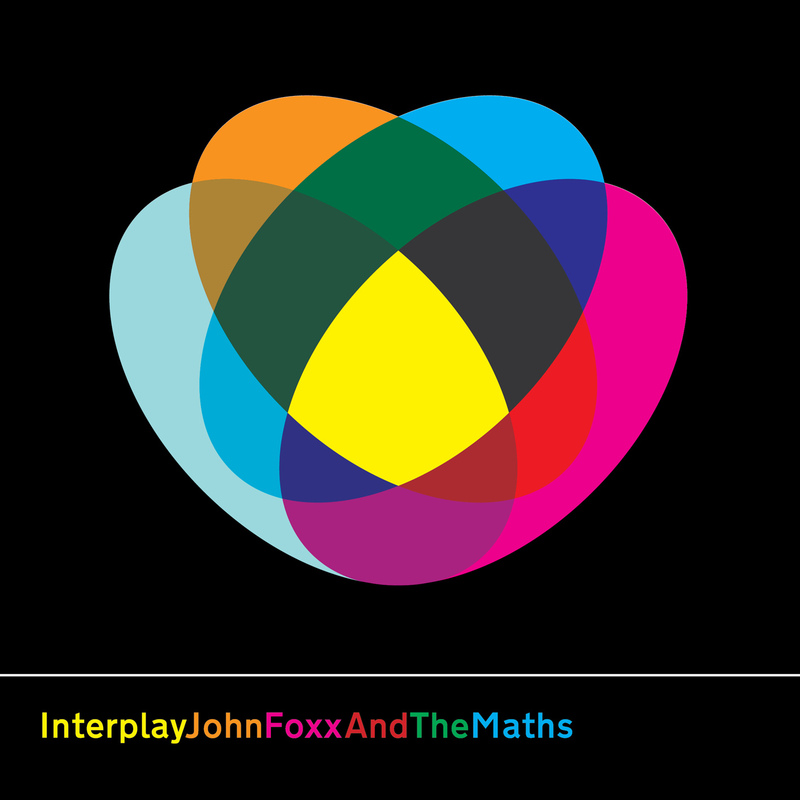 John Foxx and The Maths "Interplay"
John Foxx was the original singer for Ultravox (He wrote "Hiroshima Mon Amour"), and his legendary solo album "Metamatic"inspired Gary Numan's early work. This year Foxx partnered up with Benge and his famous studio full of vintage synths. "Interplay" was the result, an album simultaneously futuristic and retro. The songs are strong, tight, and catchy, and the production is vintage electronica, all flanged chirping Roland drum boxes and buzzing, thrumming, swooping, and grinding synthesizers. Ultimately the record shows that it is possible to make something fresh, solid, and real with what most people would consider a dated palette. You can hear single "Evergreen" on SoundCloud. Ford and Lopatin "Channel Pressure"
There were several albums by new or young groups this year that tried to either capitalize on "the 80s" or falsetto-based synth-funk from the 80s. Artists like John Maus and The Weeknd made watery, cargo cult records which failed to make any positive impression with me. Ford and Lopatin's "Channel Pressure", on the other hand, takes those elements and signifiers (parts were recorded at Jan Hammer's studio!) and does something great with them. Memorable songs and modern, glitchy production are interleaved with instrumental bits to create a Floydian whole. It took a few listens for me to understand it, but I appreciated the challenge and depth. You can hear single "Emergency Room" on their label's website. The Cars "Move Like This"
It sounds just like old Cars albums. Many bands struggle to achieve a return to form and fail. Many more achieve it only to find it's an empty exercise. Given that, hearing The Cars (minus the late Ben Orr) do this so well was quite satisfying. Songs like the wistful "Soon" are easily as good as anything they've ever done. Thievery Corporation "Culture of Fear"
Remember the Golden Age of Trip-Hop, back in the late 90s? Thievery Corporation do. Their new album, "Culture of Fear", is a clear throwback to those days of yore. For better or for worse, this album would mix seamlessly with Morcheeba's "Who Can You Trust? ", Massive Attack's "Protection", and Air's "Moon Safari". This record is an easy listen and is nothing new for Thievery Corporation, who were a part of the Golden Age of Trip-Hop and have been more or less doing the same thing for a dozen-plus years. It's still enjoyable, as long as you skip the title track, soured by Mr. Lif's tedious rapping. My appetite for metal continues to wane, aside from the occasional unimpeachable classic. This album fulfilled my quota this year. Mastodon is a great band, not just a great metal band. Their music is arty and powerful. This year, Mastodon made a U-turn from increasingly elaborate concept albums to make their version of a "concise pop" album. Despite the p-word, this record still growls, punches, and kicks like a bar fight. It sounds great and doesn't wear out its welcome. I will be listening to it again and again! You can read lyrics and hear this album at the band's website. 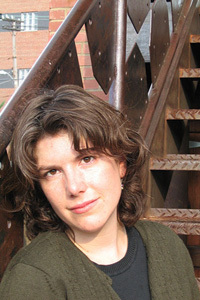 My friend and teaching partner Adam Tober told me that Jen Fitzgerald had passed away. 4 years ago today. She wasn't even 30. I'd fallen out of touch with her after teaching at TIP in 2006. You can read some details here and here, and you can hear some of her music on MySpace. What you really need to know is this: She was a sweet, funny woman who did a better job of teaching in the few hours she "guested" in my class than I did in the whole week. She was a talented and passionate composer. She kept me excited about teaching and music, and inspired me to keep writing and practicing. I'm on a Virgin America flight to Seattle. Self-upgraded to first class. I look out the window. I see a sprawling cloud landscape in blue and pink-yellow, stretching off to infinity. It's a whole different planet out there. I put my hand to the window and feel the cold seeping through the hull as we rocket over the cloud cover. As the plane turns and descends, the sun sets. Colors blossom. I see the moon appear suddenly over the pastel bands of the horizon. The cloud layers are translucent, and I marvel at the complex beauty that results from them sliding across each other. Seattle's lights gleam below. As we start our descent and drop through the white-out, I think of my good fortune at having seen such a thing. Truly wondrous and beautiful, a special moment. A woman calls my name. I turn to look at her and it is several seconds before I'm able to recognize a friend. We used to work together. Kindred spirits in many ways. She's got different hair now and new glasses. We are separated only by a few miles back in the Bay Area, but it's still been two years since we've seen each other. She's also on her way up to Seattle for the Rhapsody party. We share a cab and catch up on the way in. Of course, I'm staying at The Edgewater, as I did many times when working for Rhapsody. Many of our peers wonder why, preferring newer, flashier places. I'm still taken with its slightly faded Kubrick/David Lynch/Twin Peaks.com vibe. In the last 2 years, they've tarted it up a bit, but it's still funky and unique. Hanging on, literally and metaphorically. And so many memories. The old RealNetworks building is on the other side of the train tracks. Rhapsody's offices aren't there anymore, having moved to a hipper part of Seattle some time ago. But the party is walkable from here. I ride up in an elevator with 3 middle-aged professionals, talking to each other about their alcohol intake the night before and how it impaired their ability to participate in their management offsite meetings today. I find my room, change into gym clothes and hit the fitness center. I'm alone in there for most of my workout. A great remix I did of a friend's song comes up on my MP3 player. Their album never came out, but the track and the remix are good. It's a shame. They really could have been something if they got their act together. I clean up, eat some dinner, and roll out into the cold Seattle winter night. The last time I recall walking this way - in this kind of cold and dark - was many, many years ago, with a woman whose life has changed even more than mine has. Our paths crossed briefly but profoundly. I remember seagulls over the bay, their cries echoing off the buildings and water in the sun. She's not here in Seattle anymore. I wonder how she is doing, and I think of another woman I know who's moving to Seattle with her boyfriend in the next month. I pass many homeless people on First Avenue. I am reminded of my long walks through DC after high school winter evenings volunteering for The Jamestown Foundation. It must be hard to be homeless in Seattle. There's a line around the block to get in to the party, but I'm on the VIP list, so my line is shorter. I shuffle in next to a few former colleagues and watch as more arrive. There are lots of people here, most of whom I don't know. It's very crowded and loud. "So, what are you up to these days?" I chat up the people I recognize. I'm surprised at who is there, and who isn't. Everybody seems very happy - there are new children and new relationships and new jobs. All the trouble and hassles of the past are forgotten, forgiven, set aside, or buried under very convincing smiles. "Are you still at MOG?" "How's MOG doing?" Bands play. Drinks get drunk. The food is demolished. Hours slip by. Look, there's the CEO, next to the billionaire. Look, there's my old boss. Hey, there's the guy who laid me off. There's the guy who replaced me. There's that guy I always passed in the hall. There's Peter Buck, guitar player for recently-disbanded REM. I tell him "Thanks for the music!" He smiles and nods and thanks me back. I look around. I am reminded of my high school reunions. It's time to go. Aches and pains and fatigue are creeping up on me. There's a lot going on in my life right now, a lot of things in motion. I push my way through the doors, out into the winter cold again. I say my last goodbyes to the smokers and stragglers out front. As I walk past all the closed storefronts, I think of doors opening and doors closing, separating inside from outside. People walk in, people walk out. You were here. Now you are there. This used to be the future. Now it is the past. A train rumbles past, horn blowing. The moon shines down, and its reflection shimmers in the bay. The seagulls' cries echo across the water. It's rare in life to have a good idea, the means to execute it, and actually manage to bring it to fruition. 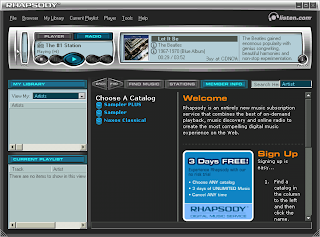 About 10 years ago, Listen.com launched Rhapsody 1.0. I was the product manager. One part of a team of talented, hard working people who brought it into being. The thing I remember best was the feeling of excitement - we were building something nobody had ever seen, and we were going to beat the competition, and we were going to beat the major labels and companies 10 times our size. And it was going to be amazing. And it was. Rhapsody created a new way to think about media consumption, more or less. For better or for worse, it's spawned a legion of imitators, copycats, and followers. So far, they all copy the Rhapsody template, and nearly every "new" feature they've brought out or added was something we had already thought of and had to put in the "do later" pile. Unfortunately, the other guys copied most of Rhapsody's mistakes, too. It's become fashionable recently to bash subscription services for "not paying enough" or something like that. Most are still struggling to get by. It's still a far cry from just a few years ago, when people were wondering whether or not it was a dumb idea. I've become a much better product manager and designer in the years since. I've worked at other companies, with other people. On bigger projects, smaller projects...you name it. 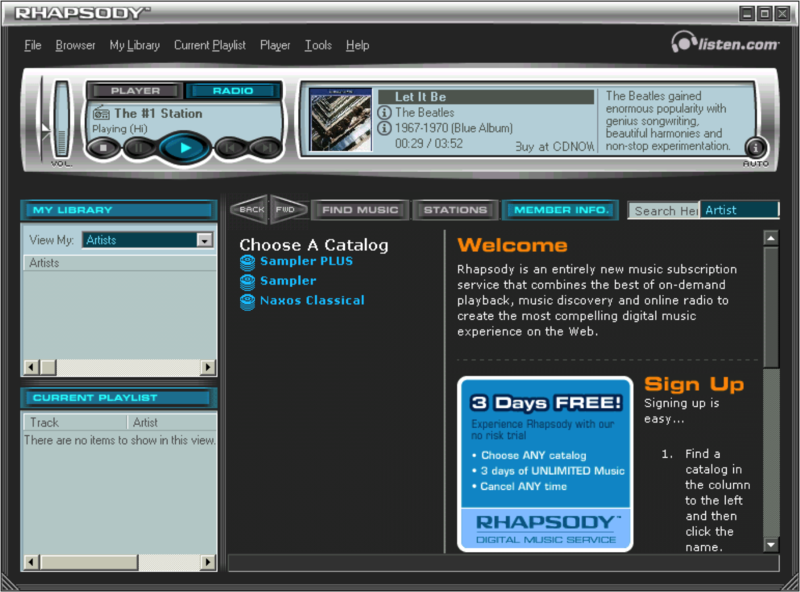 I even worked at Rhapsody a second time as the General Manager of Product Management and made their first iPhone app. But nothing I've ever worked on felt as good as shipping Rhapsody 1.0. In retrospect, the best part has been the people - all the amazing people I've worked with and learned from over the last 10 years. Too many to name individually, but you all know who you are!